In 2013 I read a book by James Altucher entitled Choose Yourself. I had been a regular reader of his articles and books and at the time I was going through a major life transition on all levels. I had lost my job and moved in with my parents in 2009. I was able to find part-time work but was not making enough to move out. I was desperately depressed, my marriage was on the rocks and my life seemed stuck. There were many things that helped me to ultimately turn my life around but one of them was James Altucher’s book. One of the things he talked about that really stuck with me was the idea that the 9 to 5 corporate cubicle jobs that disappeared in the recession of 2008 were not coming back and the ones that remained would probably disappear eventually as well. The only way to survive ultimately is to become an entrepreneur — to choose yourself. Somewhere in his book he also mentioned that he was interested in what motivated internet trolls. Knowing a thing or two on the subject I sent him a long email explaining my experiences and what I thought were my motivations when I trolled. To my surprise he responded pretty quickly and asked if he could use what I wrote for an article. I agreed. After his article was published (thinking along the entrepreneurial lines he espoused in his book) I asked if he was interested in collaborating on a book about trolling. Graciously he encouraged me to write what ultimately became the book I recently published entitled Shame and Internet Trolling. He told me to make it personal and embarrassing and said he would connect me with an editor when I finished. For a year I woke up at 5:00am gathering old blog posts relevent to the subject and writing new ones all of which are available on this blog. I then consolidated and edited all this information into a first draft manuscript. When I started this project my marriage was failing and I worked from home out of my parents’ basement in Connecticut. By the time I finished my marriage was great and had moved to North Carolina. The process of writing the book was incredibly therapeutic for me. I approached James and told him I was finished with the manuscript. He introduced me to a person named Zach Obront who works with people who publish ebooks. For about $2, 500 he offered to edit and help publish and market my work. I agreed thinking at the very least this would be a learning opportunity on the process. He then assigned an editor to read my manuscript. Based on the editor’s really helpful comments I spent another couple of months rewriting and editing. Having an editor read and comment on my writing was definitely a crucial part of the process. Finally I had a finished product. Zach suggested I use 99 Designs to set up a competition to design the cover artwork. It cost around $250 and took a few weeks to fully play out. Using their service I set up a contest where artists submitted book covers which I rated and gave feedback to. Then there was a final round where the best contributors competed for the final design. In the end I selected a winner who received a cash prize. Once the cover art was completed Zach suggested I use Bookbaby to digitally convert my manuscript into an e-book and then distribute it to Amazon, Barnes and Noble and other outlets. This also cost about $300. I would definitely recommend both of these services. Once the book was distributed Zach provided a list of blogs, podcasts and other media outlets I could approach to market my book as a guest writer. This, I found to be the least helpful part. Most of the outlets he mentioned specifically did not want their guest writers marketing their books and many of them were not really on point with the subject of my book. So if I had to do it over I would have skipped the marketing aspect and would have saved myself about $1000. Probably books on more marketable subjects would benefit more from the research Zach and his people provided. So that’s my experience of writing and publishing my e-book. I am still in the marketing phase so I will probably have more to say on that subject as I figure out what I am doing. 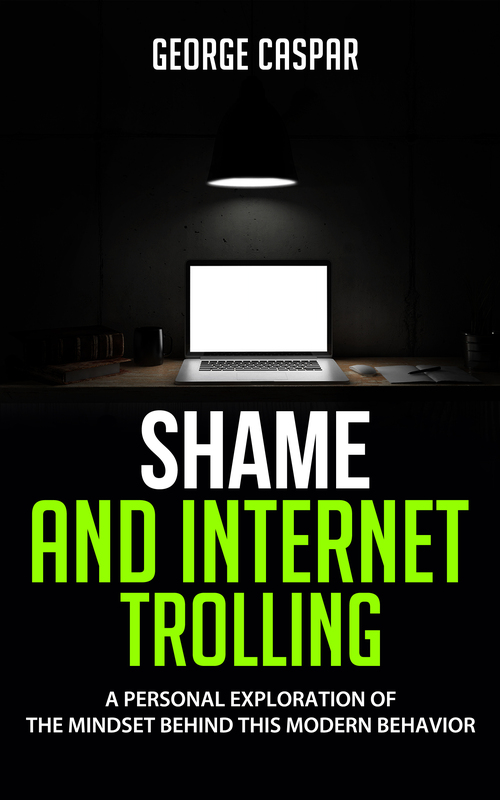 Check out my newly published eBook entitled Shame and Internet Trolling. “Shame and Internet Trolling” is about my life journey through shame and how it led to me becoming an internet troll. The book is divided into three parts. In part one I discuss my life history up until I began trolling as it relates to my experience of shame. In part two I discuss my experience trolling, how it felt and the methods I employed. In part three I discuss the series of experiences that brought me out of shame and internet trolling. Admiralbill frequently accused me of baiting him. That is, he accused me making posts designed to get him upset and react by responding to my post in an angry manner. He was right. I frequently posted articles in the politics section of Sistertrek.net that made the Republican party look bad. Since Admiralbill was a rabid, conservative Republican I could be sure of him responding. Since I enjoyed making him angry, that made me a troll. He called me a troll especially towards the end. He was right about that also. There is no doubt that I deliberately posted inflammatory articles for the purpose of starting arguments with him. Of course I denied this was what I was doing as all respectable trolls would do. On another message board I joined, this guy Actionjeans accused me of being a clone pretty soon after I joined. This surprised me because I had not done anything yet to piss anyone off. I guess he thought that I was actually someone else who was operating a second avatar for the purposes of providing support to his first avatar. This was a false accusation but he was able to convince other people on the message board that my avatar was a clone. Another person, a friend of Actionjeans, accused me of being a sock puppet which I am guessing is essentially the same thing. When I tried to defend myself by denying these accusations they said I was acting just like the guy they thought I was a clone of. Based on my prior experience on Sistertrek I decided to pull out my big guns and embrace being a troll. I fancied myself Obi Wan Kenobi, an aged master who had been living in the desert for years and suddenly compelled to come out of retirement, use his seasoned skills and fight the good fight. I made posts designed to anger my accusers. I asked them questions designed to put them on the defensive. I was relentless. It was then that they accused me of being a stalker. I did not like this accusation, so I suppose it was correct. The accusation had the effect of deflating the feeling of wise old master. Stalker seemed much less respectable. I felt ashamed of myself. But I could not stop trying to bait them because I was addicted to the rush I got when I posted something inflammatory. So, in a private message, I asked the moderator to ban me. He did not oblige me at first so then I went all out trying to make Actionjeans angry. After a few days of this the moderator banned me. At that point I could detox from the message board and get myself clean again. That was my last experience trolling. For a long time I had the urge to get back in the game. I would think about Admiralbill and Actionjeans and get angry and wonder why they came out looking like the good guys and I came out looking like the bad guy. But the longer I did not troll the easier it became until that anger finally went away. Read my ebook Shame and Internet Trolling. Available on Amazon, Barnes and Noble and iBooks. There is a large gap of time between last May and this October where I did not make any blog posts. I spent a lot of that time working on a book that I intend to e-publish. The book is autobiographical and discusses the connections between shame and internet trolling. Much of the book is a synthesis of my previous blog posts. I have been in contact with a well-known blogger who has published several ebooks who has encouraged me to do this. So I finished the book a few months ago. The well-known blogger put me in touch with a guy who edits and markets ebooks. I got the book edited and since that time I have been trying to incorporate the edits he suggested. Once I finish that I can start the publishing and marketing stage. The only problem is that I cannot seem to finish the editing process. I used to wake up every morning at 5:00am and work on the initial manuscript. Once I finished it and sent it to the editor I continued to wake up at that time and write other things. Now that I am close to actually publishing I cannot seem to finish it. I stopped waking up at 5:00am. It is now hard for me to find the time. When I do make the time I sit and stare at what I have written and hate it. I am sure this is self sabotage. I know I have to work through it. The block is my demon trying to undermine my success but it does it indirectly and passive aggressively. It does not straight out tell me not to do it. It distracts me. It saps my energy. It makes everything else seem more interesting. I am too tired. I have too many other things to do. Is the answer to plow through it? Is the answer to defeat the demon some other way and then be able to finish my project? I am in the middle of it so I cannot see it too clearly. There is fear here too. I am afraid that once I publish the book people who are described in it unflatteringly will hate me for it. At the same time I fear no one will read it when I publish it. I hold these two antithetical possibilities in my mind at the same time. The demon, my shame ego, does not care about logic. It merely cares that I feel shame and remain stuck in my present situation. The well-known blogger I spoke of told me to edit one more time, cut 30% and publish it. I think I have to start waking up at 5:00am again. It is the time of day when I am the most creative anyway. I have a marathon to run this Sunday. Part of me is saying to put this off until that is over. The same part of me (I am sure) is telling me that I am not ready for the marathon. Ha! Trolling does not have the same hold on me now because I have made progress with shame. To make progress I first had to hit rock bottom, which occurred between 2009 and 2013. In 2009 my marriage was horrible. My wife and I did not get along at all. I was stressed out of my mind from my job and my home life. I remember thinking at the time the best part of my day was the time I spent commuting on from my house to work. I smoked a cigarette on the way to the bus. I spent a large part of my workday trolling Sistertrek. I drank at least five alcoholic drinks practically every night. I was a mess. At the time I was working this pharmaceutical document review in a building near Logan Circle in Philadelphia. This was considered to be a high-end document review with a million different rules that I never fully learned and I do not think most people really understood. I could tell my supervisor thought I did not know what I was doing which made me depressed and anxious. Looking back on it I could tell I was self-sabotaging. The building I worked in was near the basilica in Logan Circle. I went to the basilica during my lunch hour and prayed a novena to St. Jude the patron saint of lost causes that something would happen to change my career and my life. St. Jude, glorious apostle, faithful servant and friend of Jesus, the name of the traitor has caused you to be forgotten by many. But the Church honors and invokes you universally as the patron of hopeless cases, and of things despaired of. Pray for me who am so distressed. Make use, I implore you, of that particular privilege accorded you to bring visible and speedy help where help was almost despaired of. Come to my assistance in this great need that I may receive the consolation and succor of Heaven in all my necessities, tribulations and sufferings, particularly, to bring change and progress to my career and my life and that I may bless God with you and all the elect throughout eternity. St. Jude, apostle, martyr, and relative of our Lord Jesus Christ, of Mary, and of Joseph, intercede for us! On the ninth day of the novena I received a call from human resources to come to the main office building of the firm which at this time was in the Cira Center next to 30th Street Station. I knew why they called me. People had been laid off in waves for months. I feared the day but thought I was safe because I actually had work to do and real billable hours. I figured the people they were letting go could not bill enough to justify their salaries. At the time Dechert was all about streamlining expenses and cutting perks that made life less miserable for the employees. After receiving the call I deleted all the personal files on my laptop and walked down JFK Boulevard to the Cira Center. When I got there I was ushered into a conference room with two human resources people. They had empathy plastered on their faces. They seemed surprised when they asked me if I had any questions and I said no. I am sure they were used to people blowing up at them. On some basic level I felt relieved. I had spent eight miserable years working at Dechert and this day would be my last. Although there was brightness associated with closing this miserable chapter of my life I was about to begin a hellish, four-year period of being unemployed and underemployed. Everything was about to get worse before it could get better. I spent quite a bit of time baiting Admiralbill. I think it was more than five years before I was banned from the website. By the time that happened I wanted to be banned. I needed to end the endless cycle. It drained my energy. I was constantly thinking of new ways to piss him off. To this day part of me still hates how mean and self-righteous he was. It is enough motivation for me to vote Democrat knowing that in some small way it gets back at him. There is definitely an addictive cycle when it comes to trolling. First there is the exhilaration of making a smart post that proves my enemy wrong or makes him look foolish. Next, and this is usually after he responds with something I did not expect or perhaps a thread has gone on too long and both of us look foolish, self-loathing kicks in. Self-loathing, of course does not feel good. It inspired in me a new resolve never to take part in these foolish exchanges again. Then slowly the compulsion to get back in the game reemerges. All it would take was a Paul Krugman article that I found particularly persuasive and I was back in. The exhilaration is the drug that for a moment takes away the pain I feel during the 90% of the rest of the addictive cycle. I can really only speak for myself but I am pretty sure all internet trolls share a common personality type. They probably work jobs or live lives that are in someway unsatisfying. They want to feel special and crave attention and respect. They are highly dependent on the opinions of other people. When other people ganged up on Admiralbill I felt vindicated and victorious. When they ganged up on me I felt defeated and humiliated. And this is really at the heart of the matter, a message board troll feels intense shame. It is shame that motivates him to shame others. My original goal as a troll was to get Admiralbill angry and responding to me. My secondary goal was to get other people to take my side. On some level I was operating under the delusion that if I said the right thing, made the strategic argument he would admit he was wrong. He was probably operating under the same premise. There are three possible outcomes to any message board debate. One, the other person concedes defeat. This never happens but I suppose it is possible. The closest thing to this is that you get the last word in that digs at them and they do not respond. Two, you get ganged up on by everyone else and your allies run for cover. This is defeat, although a true troll will never admit this and will argue that he is being treated unfairly or is misunderstood in some fashion. Three, the moderator steps in and shuts the thread down. This is actually a relief sometimes. When this happens the troll can say to himself that he never gave up and fought the good fight (force majeure). If I got the last word in before the thread was shut down and before he got a chance to respond, it felt as good as any victory. If my adversary got the last word in, it stung but I could still say it was out of my hands. As I said earlier when I got banned from Sistertrek I wanted to get banned. I could not simply walk away and never post again. My addiction was too strong. So I dug at the moderators until they banned me. It worked and that was a few years ago. To this day I still think about it and hate Admiralbill. But every day I do not participate in Sistertrek the hatred goes away a little bit more. I actually logged on to Sistertrek anonymously to see what was going on not too long ago. The website is basically run by conservatives and they kicked off all the liberals some time ago. It is a shell of the community it once was. There are no longer any lively debates as far as I can tell. This sort of makes me nostalgic for the good old days.